For those new - BotCon is an annual Transformers Convention in America (finally being promoted as an International Convention), started in 1994, and this year it was held in the home state of Hasbro HQ - Providence, Rhode Island. If you are a Transformers fan and just want to see the news and info from the Transformers convention, the first block of links are for you to use. If you are NOT a fan, or are interested in following the entire adventure, skip to the second lot of links that details my entire trip. Dealer Room (upstairs), Sector 7 & Optimus Trucks (downstairs), Video Room, Attacktix, & Autographs area. For those who aren't Australian - Ozformers is a fan community in Australia that has been around longer than most American fan communities (started in 1996), and I'm registered on most major foreign forums as 'griffinofoz' (don't have time to interact on all the major ones, and one wouldn't let me join anyway) . This was my eighth BotCon (including 2003, which *was* briefly labelled as 'BotCon' in the advertising at first), but this was also the most expensive so far, with the basic costs (flights, accommodation, pre-registration) coming in at just under AU$5,000 (about US$4,200). The biggest negative thing though was missing out on the Hasbro Tour. I faxed in my form on the fourth day, to make sure I had funds in my account, but it wasn't quick enough, and I've been regretting it ever since. What's worse is that I let it consume me to the point where I was angry at Fun Publications and Hasbro for not making sure more fans were on the tour in place of the non-fan relatives that just happen to be on the first few hundred pre-reg forms (or they could have had a fee going to a charity, like the Movie screening, to prevent the less commited fans from taking up spots just because it was a free option on the form). In the end, this was *my* fault, because I knew that there is a delay in charging credit cards and should have faxed in my form on the second day (post office was closed on the first day), and I am so angry at myself for missing the one thing that I had been dreaming about for years (no, really!). And I wasn't the only one that missed out who really wanted to go, so I can't feel like I was "entitled" to go over others. I was just annoyed that some people didn't end up going, and others went who had no interest in the tour but were there with their partner/relative. The journey this year was the most extensive I've ever taken for a BotCon, due to my friend Ian going and organising a pre-Con adventure in New York. This was the first year I had actually had the time and money (and confidence) to do something else around the Convention itself. Usually I just fly in, spend a day toyhunting in the host city, do the Con, and fly straight home. Since this year went so well, it should inspire me to consider doing this more often in the future... to make it a more diverse and interesting adventure each year. On the map above, the journey there was from Brisbane (B) to Sydney (S) to Los Angeles (L) to New York (N) and to Providence (P). 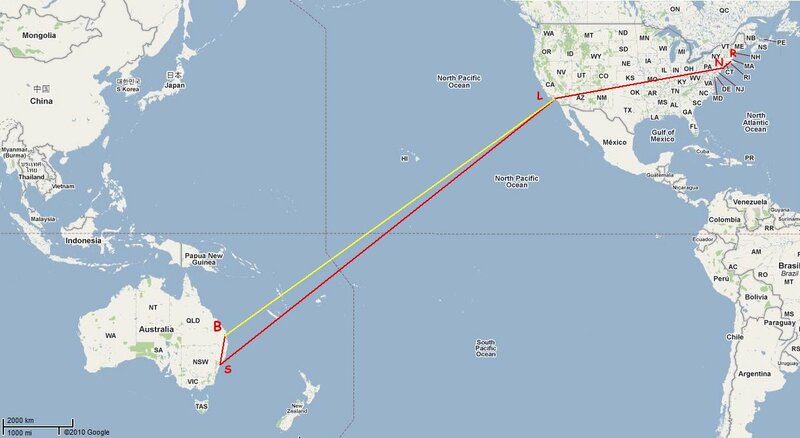 The journey home was the reverse, except I flew directly back to Brisbane from LA (the yellow line). I was in New York for 2 nights (with Ian) and was in Rhode Island for 5 nights (sharing between Liam and Ian at the two different hotels they were staying at). Three new US states visited or passed through, making it 10 for me so far - California, Minnesota, Illinois, Indiana, New York, North Carolina, Texas, Connecticut (only passed through by train), Rhode Island, Massachusetts. Plus one or two other Australians apparently, who do not interact on the local forums. I rate each BotCon in 10 categories, from 1 to 10 (1 is very bad, 5 is average, 10 is excellent) giving a total score out of 100. That gives me a total score of 78 for BotCon 2007, making it the second best one for me behind BC04 (which scored 81). - Optimus in person, in both senses. Peter Cullen (seen him before, but it's always a thrill to see and hear him in person), and the Truck from the Movie. Since the only two physical robot forms built were Bumblebee and Frenzy, the Vehicle modes of the Transformers cast are as close as us fans will get to real life Transformers, and with that in mind, being able to touch THE Optimus Prime was beyond words. - Toys. Managed to get a few toys I wanted, including Cullen versions of the Helmet and Stomper, a boxed complete Gen1 Dezarus/Deathsaurus, Headmaster Rodney (only need Shafler now to complete the set), Nike Convoy and Megatron, some recent Hasbro figures not released here, and a Minispy to complete my US Hasbro Gen1 (1984-1991) collection. - Hasbro display and panels, showing new product and the new Animated show details. - The company of two other Australians this year. I didn't get as much done that I wanted to, but at least I never had a dull moment. - Catching up with a number of American fans I only get to see once a year. - The exchange rate at its best for us Australian tourists in 18 years. Which meant getting more toys for less money. I still had trouble convincing myself to buy stuff in the dealer room that was priced to kill. I actually managed to come back home with about AU$2,500 left on my credit cards, which was the first BotCon *ever* which I didn't drain my entire cash and credit funds at the convention. - This was the first BotCon trip that I actually scheduled extra days to be a tourist, spending two days in New York City on the way to Rhode Island. The 'City of Steel' is one American city I have been keen to visit for some time now, and this year I was able to afford it and had the extra time to do it. Spending the time there with Ian and Caroline was fun as well, especially after I got the Optimus Helmet and Stomper to drive her crazy playing Cullen's voice over and over again. - And this year I was in the most amount of US states - 5 (that's two more than my previous best years). I landed in California, stayed in New York state, travelled by train through Connecticut, and the Convention was in Rhode Island, while Liam and I managed to walk across the state line into Massachusetts while shopping (which we didn't even realise until a week after I got back home). If I'd taken a bus instead of a train between New York and Rhode Island, I'd have gone through New Jersey as well... but maybe in a future year I'll cram in more states during a Convention trip. - Missing the Hasbro tour (okay, I won't go into it again), but it was the one BotCon event I most looked forward to this year, because I saw the Movie in early June (so this one wasn't an advance screening for me), and with eight BotCons to my name, none of the guests were new or interesting enough for me this year to get all excited about. - Expensive Internet access at Hotels this year. What was once a free service in previous years, hotels seem to be profitting off the reliance on internet access, and not by a little amount either. The hotel in New York charged US$15 per hour, the public internet kiosk around the corner was US$18 per hour, the Biltmore (second convention hotel) in RI charged US$30 per hour, and the first convention hotel charged US$12 per hour. Those prices are more than what most pay per month for internet access, which is absurd. The third convention hotel was the only one with free access, but it was limited because it was using a couple of their office computers, and there was some demand for access on the one evening I was on it. - I lost my commemorative Movie ticket. Even though we were given a regular movie ticket as well, the 'keeper ticket' had printed on it that it was required for entry, so I took it along, and managed to drop it in the theatre but couldn't find it later (I realised it when we walked out of the theatre, but when I went back in to find it, I couldn't see it). - Last minute announcement of the guests, because Fun Publications (the organisers) were too busy hyping up the toys for the dealers, scalpers and investers (instead of hyping up reasons to actually attend the event). Up until the week before the convention, there was only one guest being promoted (David Kaye), and of those that were added to the website at the last minute, none were first-time BotCon guests. The Movie writers were great, but I was really disappointed that FunPub weren't able to get anyone else from the movie, or any first-time guests. It just seemed like the organisers resorted to easy guests at the last minute, because they had run out of time or resources to chase up anyone new. I know appearance fees for stars can be hefty, but was there absolutely no one else from the movie interested in being a guest at the one and only convention for the movie they stared in? Surely Paramount or Hasbro could have come to the party with the appearance fees, considering two of the Movie stars were already in Rhode Island for the non-BotCon charity screening of the Movie... and us fans were making them money. BotCon could have achieved a status of being more than just a toy convention this year. It could have been classed (and promoted in the mass media) as a more significant Toy AND Blockbuster Movie Convention. - Taping of panels was banned this year. It's not really a direct concern for me, but I'm one who likes to buy/acquire recordings of BotCon whenever possible, so having the organisers prohibiting it was a bit annoying for those of us who would love to have a video memory of the main feature of the convention (the panels & guests). It looked like FunPub were recording the panels, but said that they wouldn't be making copies, so maybe they need to be reminded of their motto - "by fans for the fans". For all you fellow Australians out there, this is what America is all about. Everything has to be bigger, tastier and unhealthy. 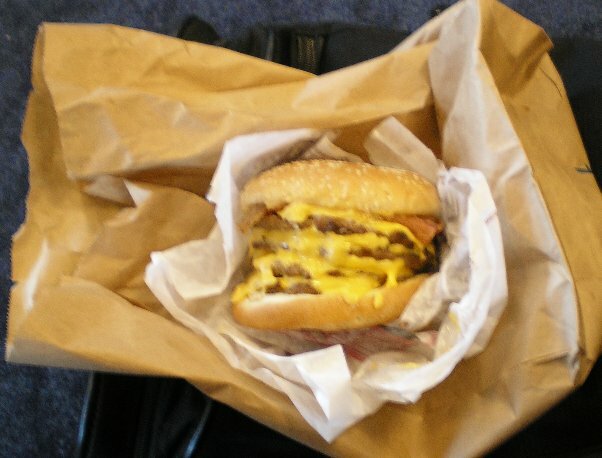 This was the first thing I ate in America this year, while waiting for my connecting flight from LA to New York. It was from a Burger King (they're called Hungry Jacks here in Australia), and not only did they have Triple Whoppers on their *standard menu* (we only have doubles on our standard menu), but they also had something called the 'Quad Stacker'. It has four layers of meat and four layers of cheese, topped off with bacon and sauce. My arteries were hardening just looking at it, and I knew I had to take a photo of it. I still laugh when I look at this photo, because it reminds me how unhealthy it can be over there (not surprising that they have the highest obesity proportion in the world - but we're not too far behind). They call Burgers "sandwiches" over there, and apparently this one has been around for a year now because it is so popular. HJ's here actually had the BBQ Beef Stacker a few months ago, based on this BK version, but we still only got up to the Triple, not a Quad. One of the things I love to do over in America is to sample their junk food and check out their grocery stores... or at least, the breakfast cereal aisle. We have around 5-6 sugary kids cereals here. They have like 5-6 *dozen* types at any one time. And this year I found something that just had me amazed at how bad it is getting over there. Special K is one brand of cereal you would think couldn't possibly be available in an unhealthy variety, but this year I found a 'chocolate chunk' edition, with actual chunks of chocolate. To make it more amusing, it had a promotion on the packaging to lose weight with their Special K range!!! How, by not eating it? Lucky I went on a diet in the months leading up to the convention, because all the junk food over there puts on about 5-10 Kilos each trip. ***About 85% of the photos in this report are mine. Any that are borrowed, should have the source credited/noted. If you want to use/borrow any of my photos, all I ask is for you to please credit the source as well. I try to take as many of my own photos as possible, and usually only resort to using others if I failed to get something, or my photo wasn't clear enough. Let me know if your photo was used and you want it removed.